I love singing with classic rockers Aged Inventory, as I get the opportunity to sing some of my favorite rock hits for thousands of people each year around the US. Made up of mostly Fixed Income traders on Wall Street, Aged Inventory has helped raise over $500,000 USD via various charity performances over the past several years. Another reason I love playing with these guys is that they have a great sense of humor, and create fun projects like their recent Behind the Music-styled DVD, “Aged Inventory – Selling Out”. Here’s my segment of Aged Inventory’s DVD, which was taped in preparation of a performance at NYC’s Webster Hall. Thanks for the great compliments, Guys! We’ll be playing at The Hammerstein Ballroom!!! 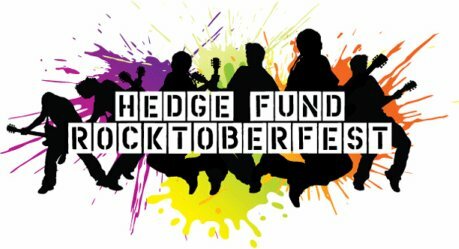 The Hedge Fund Rocktoberfest event is a “Battle of the Bands”, featuring bands made up of hedge fund managers and other Wall Street professionals. Rocktoberfest raises money for A Leg To Stand On, a non-profit organization that provides prosthetic devices for children in India, Haiti and Colombia. The organization was co-founded by Octagon Asset Management chief C. Mead Welles, who doubles as the drummer for The Subscribers, the hedge fund band that organizes the annual concert. It’s rumored that this will be the Subscriber’s “Farewell Show”, but we’ll see about that! For more information, please contact info@altso.org. Actually, that was the original plan, which has morphed a bit. Aged Inventory, investment bank Credit Suisse’s resident Banker Band was slated to play at Madison Square Park for the Fixed Income Division’s Summer Party. However, the powers-that-be in the Fixed Income division realized that Aged Inventory has a huge following, and having the gig across the street at Madison Square Park might be a logistical nightmare if they had to rope off an area that could only accommodate 300 people. The Fixed Income department alone is more than 300 people, not to mention all of our friends in other parts of the firm who want to come. So now the show has become a BLOCK PARTY!!! We’ll still have tasty burgers catered by Danny Meyer’s Shake Shack, but we’re moving the party to the street in front of Credit Suisse (Madison Avenue and E. 24th Street. Security will have more control over the crowds this way, and employees exiting the building will not be able to miss us. Non-employees won’t have access to the free food, but since Shake Shack is right there, you can still grab a delicious meal and hear some great music. And since we’ll be outside playing LOUD, you won’t be able to help but see or hear us. Ain’t no party like a summer block party! Hope to see you there!